EXCLUSIVE: The Rogue One Droid is NOT K-250, it’s K-2SO! 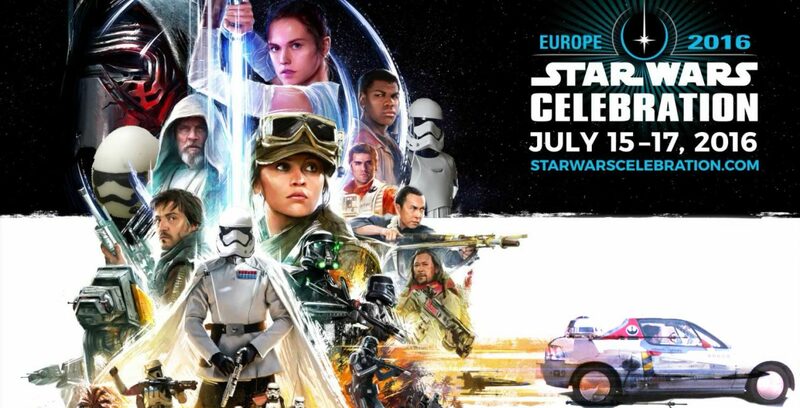 Yesterday, Disney announced the Rogue One leak was “unauthorized and filled with incorrect information.” While we wonder what kind of leaks are actually “authorized”, our Rebel spies worked around the clock to find the “incorrect information” in the leak. 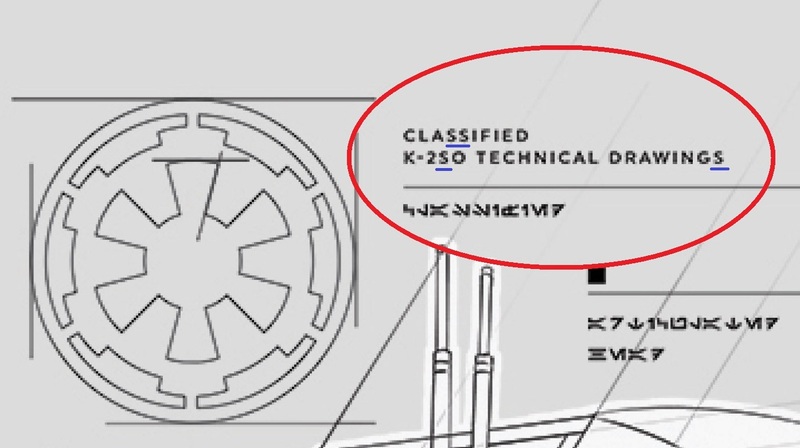 Today, we found one of the incorrect info Easter eggs: the name of that security droid is NOT K-250. The droid spread is pretty straightforward, right? The big bold letters announce his name as K-250. This is why the entire Internet, from major sites like Wikipedia, IMDB, Yahoo News, to dedicated fan sites like Making Star Wars, Wookieepedia, Slashfilm, and Screenrant, are all calling him K-250 (K-two fifty). 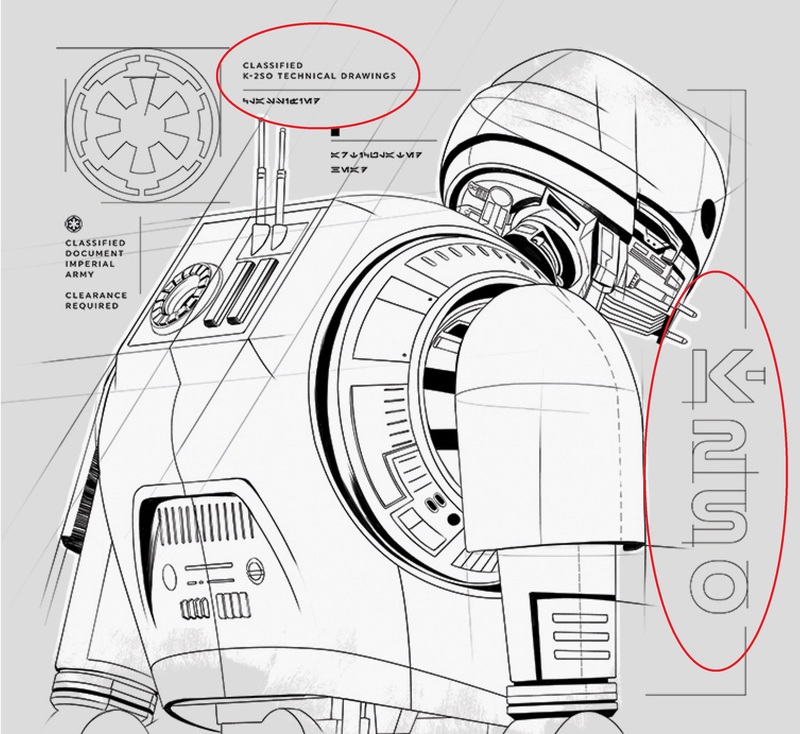 However, look closer — his name is actually K-2SO (K-two ess oh). But which is which, K-250 or K-2SO? We believe it’s the latter, K-two ess oh. When it comes to accuracy, the text content of the leak isn’t trustworthy. Content is repeated for the villains page, and even copy-pasted from the Star Wars databank for the AT-AT page. This is because they are merely filler text, used to plot the layout. Keeping that in mind, take a closer look at the title — it actually contradicts itself. The header says “K-two five ZERO” (number). Then the smaller header below it says “K-two five OH” (letter). It might be because it’s filler text hastily typed in. On the other hand, that diagram took a lot of time and couldn’t be the result of an accident. 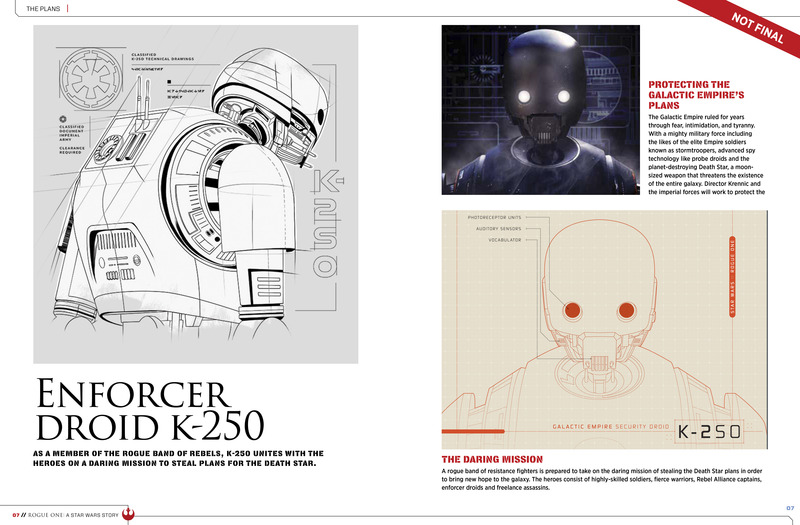 Schematic-wise, the “S” in K-2SO couldn’t be a stylized version of “five”. If you notice, it looks exactly the same as the letter S in “Classified” just above it. The big K-2SO also couldn’t be a stylized “five”. Notice how the number 2 has a straight edge. If the letter S was intended to be number 5, it should have a straight edge as well. And again, this was thoughtfully drawn out, not hastily typed in like the filler title. K-2SO follows Star War’s naming tradition of letter-number-letter-letter. Take a look at C-3PO. He belongs to the 3PO series of protocol droids. Guess what rhymes with him? K-2SO. A 2SO series not only follows the naming convention, perhaps K-2S0 was also built by the same company that made Threepio’s family of droids (Cybot Galactica). In addition, one of the Rebellion’s protocol droids in Hoth during The Empire Strikes Back was named K-3PO. So the choice of K-2SO may be a nice throwback by the Rogue One team. Han Solo used to call him “that big white rod”. If you search Google for K-2SO, only our site calls him as such. Everyone else thinks it’s K-250. You heard it here first! So the next time you see another site proclaiming K-250, tell them K-2SO is an enforcer droid, not a Keurig coffee maker. Entertainment Weekly has just revealed the official character names.